Nutritionally, ragi is higher in protein and minerals in comparison to rice. Red millet is primarily a source of energy in the diet. It is also rich in fibre and therefore suitable for people trying to lose weight. Ragi, unlike wheat does not contain gluten (a protein found in wheat), and can be easily consumed by people with wheat intolerance. Health benefits include: 1) Good source of natural calcium for growing children and older adults and helps improve bone strengthening 2) Energy for weight watchers, as it contains the amino acid tryptophan that reduces the appetite. Besides, being high in fibre, it provides a feeling of fullness when consumed 3) Beats high sugar and cholesterol – Ragi is beneficial for diabetics as well as those with high cholesterol, as the high fibre content of Ragi makes it a food item with low glycaemic index. That is, it results in slow increase in blood sugar level. I have used little cooked rice to get softer idlies. 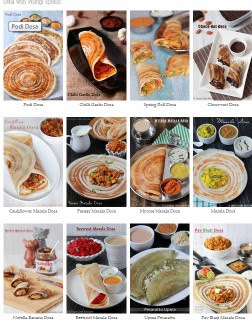 You can prepare crispy, paper thin tasty as well as nutritious dosas also with the same batter. Soak urad dhal, cooked rice and fenugreek seeds together for 1-2 hours. Grind as a fine paste in a blender. Add the ragi flour with ground urad dhal, ¼ cup at a time and mix well with ladle without forming any lumps. After fermentation mix the batter well with a ladle to make soft idlies. If the batter is too thick add a bit of water and mix well. Pour water inside the idli steamer and allow to boil till rolling hot. Slightly grease the idli plates with hands dipped in oil. Fill the idli plates and steam for 8 to 10 minutes. Serve hot with any chutneys/ sambar. Very healthy idli and looks very soft too. Awesome... First time seeing this idli. Healthy recipe. Definitely will try this and let you know.